I know these posts have been less frequent than Comcast billing department phone calls, but new releases have been few and far between lately. My ability to actually get the few new releases in my house in one piece is even rarer, as you can see in the picture. At least this one made it into the house, but it fell out of the Il Vicino bag that held contents of errands to Smiths and Jubilation as well as the Il Vic salads. 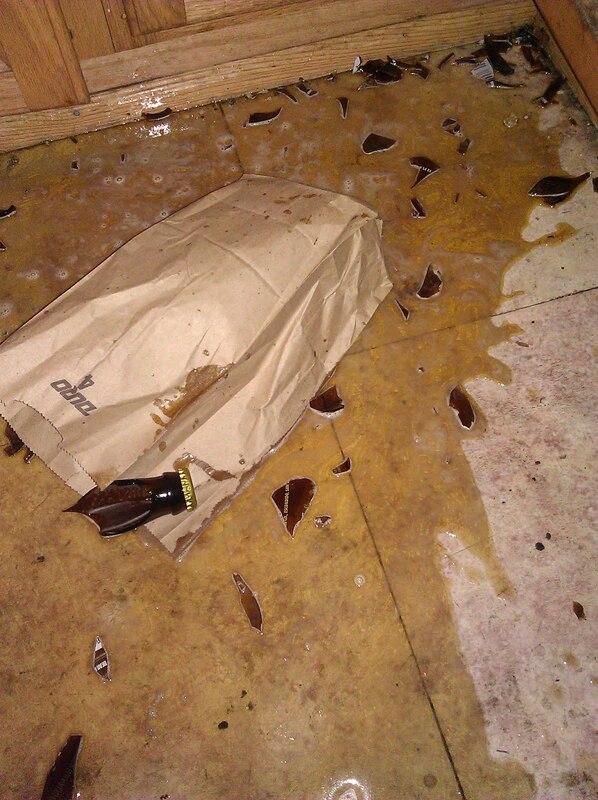 The unfortunate victim here was TBA, or Texas Brown Ale, the new Stone Brewing Company collaboration with Bear Republic and Fat Head's. The Texas Brown Ale style is far less conservative than the rest of Texas- more like a Brown Ale base that is too hoppy to fit the style due to the liberal use of Cascade hops; no surprise that Bear Republic and Fat Head's would play a part in this one. You traveling hopheads are no doubt familiar with Bear Republic's Racer 5 IPA, and Pittsburgh PA's Fat Head's are the makers of Head Hunter IPA, two-time medalist at the GABF and also two-time (and reigning) winner of the National IPA Challenge. This version of Texas Brown Ale utilizes brown sugar and molasses along with the Bravo, Columbus, Brewer's Gold, and of course Cascade. As an homage to the style, Stone's Randy Clemens says they used Cascade for the VERY FIRST TIME in their 15 years of brewing...whaaaat? Couldn't they have borrowed a cup or two from Sierra Nevada in all that time? You know Sierra has enough to stretch around the world. Jubilation has enough TBA to fill your fridge, $3.99 per 12 oz. bottle. 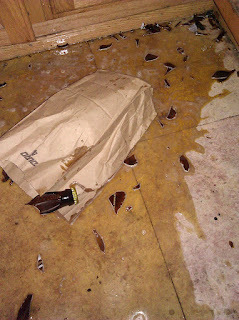 you really need to stop dropping beer. much better use is for drinking. looking for new release news? just picked up a couple sixers of Santa Fe Black IPA at the tap room. it's on tap as well, very nice. Deviant Dales around here. I been looking but haven't seen it yet. 1. All I have heard about Iceland as far as beer is that it is a beer wasteland and that beer is very expensive. 2. Thanks, gonna have to get someone to get me some of that Black IPA. I enjoyed the sample I was given awhile back. 3. The Oskar Blues rep told me it was most likely leaving Lyons, CO on the truck March 26, but it depends on when the distributor wants to put it on the shelves. Thanks for info and keep up the good work.